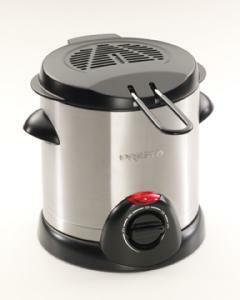 Fry delicious deep fried foods, fast and easy, in this space-saving deep fryer. Brushed stainless steel exterior with anodized aluminum interior for fast, even heating. Adjustable thermostat for easy temperature selection. Handy indicator light signals when the fryer is plugged in. Vented cool-touch cover with built-in spatter screen reduces odor and spattering. Compact size saves counter space and stores easily.